This project contains pytudes—Python programs for perfecting programming skills. Automatically converting informal English sentences into formal Propositional Logic. How crowded will this neighborhood be, if nobody wants to live next door to anyone else? Solving the equation 10 _ 9 _ 8 _ 7 _ 6 _ 5 _ 4 _ 3 _ 2 _ 1 = 2016. From an Alex Bellos puzzle. Find a pair of dice that is like a regular pair of dice, only different. Solving the “Cheryl’s Birthday” logic puzzle. Inventing new puzzles in the Style of Cheryl’s Birthday. A Puzzle involving placing rectangles of different sizes inside a square. Bonus: cryptarithmetic. Golden State Warriors probability of winning the 2016 NBA title. The word game Ghost (add letters, try to avoid making a word). Searching for a long Panama-style palindrome, this time letter-by-letter. Refactoring the Scrabble / Word with Friends game from Udacity 212. Find the smallest regular expression; inspired by Randall Monroe. Regex Golf: better, faster, funer. With Stefan Pochmann. A tale of a bicycle combination lock that uses letters instead of digits. Inspired by Bike Snob NYC. What word has the longest path on a gesture-typing smartphone keyboard? Inspired by Nicolas Schank and Shumin Zhai. Spelling Correction, Secret Codes, Word Segmentation, and more: grab your bag of words. A surprising appearance of the Sierpinski triangle in a random walk between vertexes. How to write an interpreter for the BASIC programming language. The cellular automata zero-player game. Code and examples of the basic principles of Probability Theory. Some classic paradoxes in Probability Theory, and how too think about disagreements. A classic Computer Science Algorithm. A simulation of a simple economic game. My utility functions for the Project Euler problems, including Primes and Factors. docex.py A framework for running unit tests, similar to doctest. 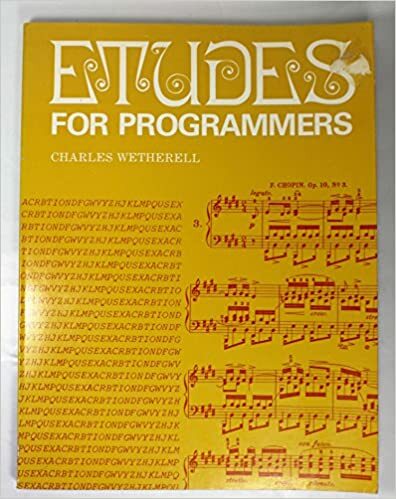 I got the idea for the “etudes” part of the name from this 1978 book by Charles Wetherell that was very influential to me when I was learning to program.